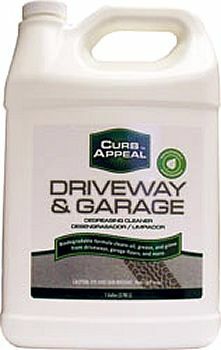 Curb Appeal Driveway & Garage Degreasing Cleaner is a great companion to our Pour-N-Restore Oil Stain Remover. Curb Appeal is formulated to safely clean driveways, garage floors, decks, patios and other hard surfaces. It breaks down surface oil, grease, food stains and grime to restore a clean and fresh appearance. While the concentrated formula, used full strength, tackles tough grime it can be diluted for light-duty cleaning. The biodegradable formulation utilizes natural solvents instead of harsh chemicals and has a pleasant, fresh scent. The product prepears garage floors for finishing, by promoting adhesion of paints and sealers. Tough embedded oil stains should be treated with Pour-N-Restore® Oil Stain Remover. Curb Appeal can be safely used on asphalt (blacktop), concrete, brick, stone, patio blocks, etc.